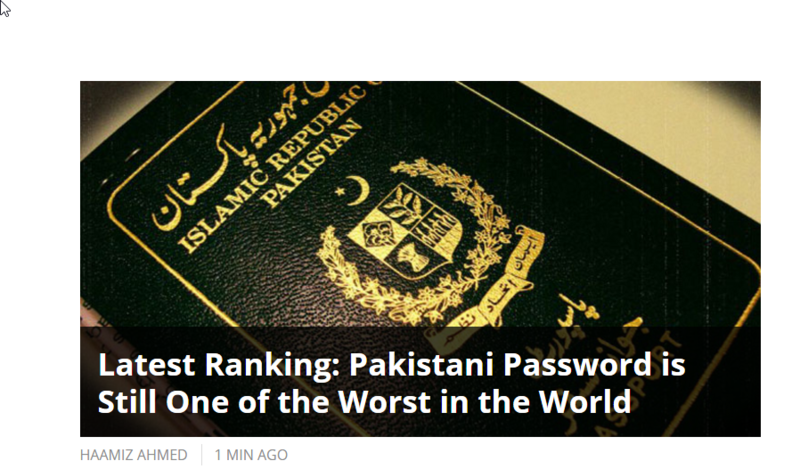 Pakistanis just can’t seem to catch a break, or at least the Pakistani passport that is. In the Nomad Passport Index 2017 released this month, the Pakistani passport was ranked at 196 out of a total of 199 countries included in the index. Why is the Nomad Passport Index by the Nomad Capitalist significant? Here’s why. The Nomad Capitalist has attracts a dedicated readership of more than three million unique visitors per year, and is increasingly seen as one of the most-visited websites on the topic of international diversification. Many investors frequent it for financial advice. Given its influence, the inclusion of the Pakistani passport in its index basically gives the impression that Pakistan isn’t an investor-friendly destination. The Nomad Capitalist assists six- and seven-figure entrepreneurs to legally reduce their business and income taxes by relocating overseas, obtain residence permits and citizenships in other countries for diversification, and invest in fast-growing international markets to grow their wealth faster. Here is how the Nomad Passport Index has ranked certain destinations based on their financial and investor-friendly credentials. Compared with neighboring countries, Pakistan ranks above Afghanistan only and is close to Iran (number 191, 27.5 score) somewhat. India and China fair better but aren’t ranked too high either. India is ranked at 160 with a score of 36 while China is ranked at 164 with a score of 35. China may have received a lower ranking due to the lack of internet freedom in the country. While India also got a rank close to China, internet freedom alone doesn’t seem to justify their ranking. They did not cite their sources but mentioned that they included information from “more than a dozen sources”. Readers are however advised to take their passport index with a grain of salt as the data they have provided cannot be verified. Disclaimer: While the information in this article is accurate to the best of our knowledge, ProPakistani does not guarantee the authenticity of the research conducted by Nomad Capitalist. it is passport, not password. Pls correct the Blog tile. password one can simple see the level of the website. EVREYOEN IS RAEDNIG OLNY TITLE :D OR HAEDNIGS. YAR AAP logon ny to blogger ki “bisti khrab’ ker di. Change the title from password to passport. There are more editors in this comment section than in ProPK staff. mujhy pakistani matti say piar hay.. jisay jalna hay jaly.. woh hoty kon hein passport ko value deny waly.. un ki cow’s eye. jo azaadi.. jo muhabbat… jo ehsas pakistan mein reh ker hay.. woh pakistan say bahir nhi mery bhai.. to passport ko galy mein latka ker kia sabit kerna chahty hein … vote nahi dena tha PML_N ko! via 3O1 redirection, it is possible! Nope, an SEO specialist! LOL !! the buttons of 0, P, Backspace are not working correctly on my laptop – now used On-Screen to write this! Tomorrow I have to change the keyboard. And the top 5 passports are of the countries which are either atheists and least religious. Now just think for a moment how can we be better off without religion. Religion is not compatible with science in this 21st century. I’d cautious if I were you. This place isn’t friendly for secularists. Yes you are right but sometimes I can’t be a hypocrite to tell the truth in any situation. That one factor isn’t the only influencing variable. Those countries also promote sensible education, communal tolerance and scientific progress. Also, eliminating part or whole of a social idea is more difficult than molding it to right direction and that is what we need to do with religion. akas, Oh please just shut up. and who are you to order here? IF progress prosperity and happiness is synonymous to Atheism than why China is not at the top position which has the largest Non Religious population (75+% of the Total World Non Religious Population).But look at the majority of population in China they hardly have any type of savings and struggle to keep with their monthly needs and their passport is also not so valued. Only 5-10% of the Population are Atheist in these countries 10-25% are 60+ % are Christians.And Spain and Italy are the most religious European countries Spain 85+ Christians .Non-Religiosity is present in Europe from a long time its not a new thing. Progress and Prosperity doesn’t depend on Science and Religion it depends on HARD-WORK,HONESTY and moral values of the population.There passports are TOP because there people are honest and hard-working which our religion taught us to do but is followed by them.Just like Caliph Omar(RA) law is being followed in Sweden which should have been followed in Muslim world. Henley’s index is a much better indication of the visa privileges offered to passport holders for travel. Oh gimme a break! Passport rankings stay the same for quite a long while Why would you report Index & rankings every month!! P.S. half of the country doesn’t even own one anyways. Worst article I have read in many days. Please don’t believe a word in it. Carry your passport with pride.